Black Families Rock! 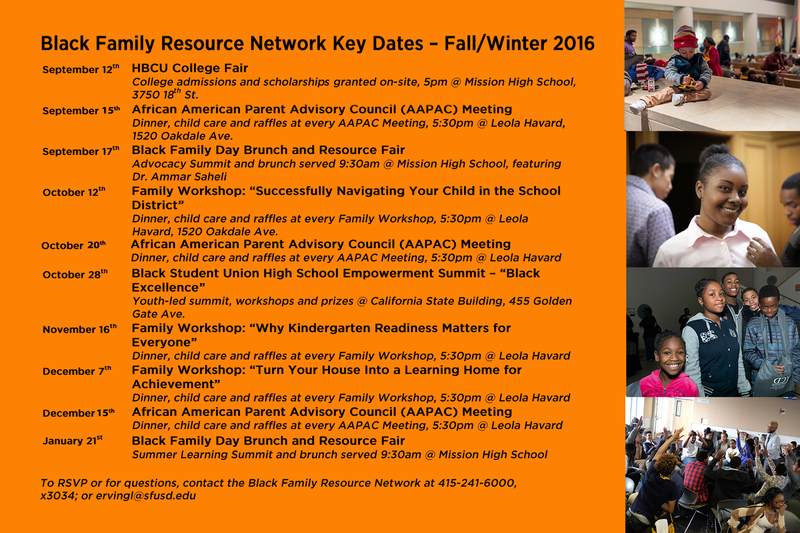 | #BlackFamiliesRock - Fall 2016, in SFUSD! This fall, I’m excited to share that there will be TWO upcoming events sponsored by SFUSD via the African-American Achievement and Leadership Initiative and in partnership with the San Francisco Alliance of Black School Educators, 100% College Prep, Mo’Magic and other amazing organizations focused on helping Black students access college and career opportunities. Please spread the word to let everyone know about them. They are both great opportunities for ALL AGES. Tell your friends! 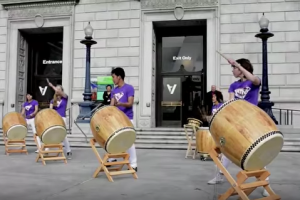 Let’s make sure #BlackFamiliesRock this fall in SFUSD! 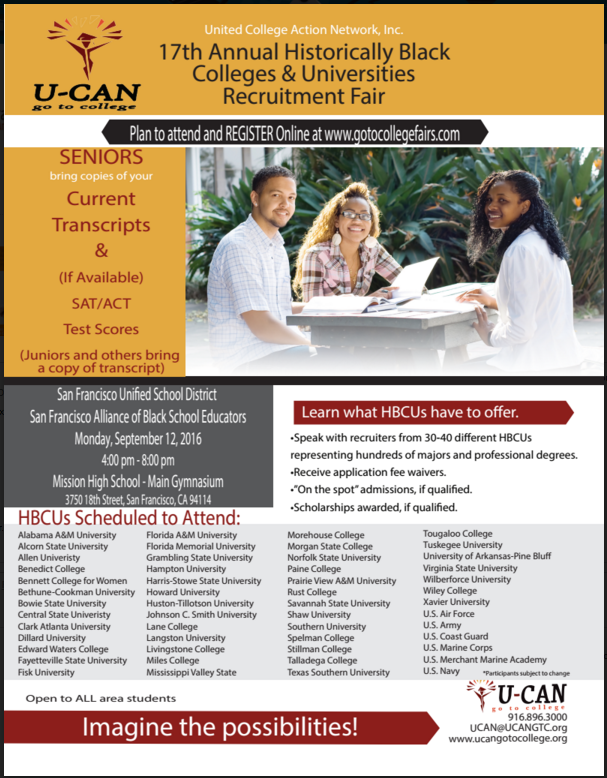 The San Francisco Unified School District in collaboration with the San Francisco Alliance of Black School Educators will host the 3rd Annual Historically Black College and University (HBCU) Fair on Monday, September 12, 2016 at Mission High School from 4:00-8:00pm. Official representatives from 30 – 45 of the country’s leading Historically Black Colleges and Universities (HBCUs) will be recruiting college-bound students on-site during the event. Interested high school students will have the opportunity to receive preliminary “on-the-spot” admissions, scholarships, financial aid information and face-to-face exposure with many of the most respected historically black institutions of higher learning within the United States. 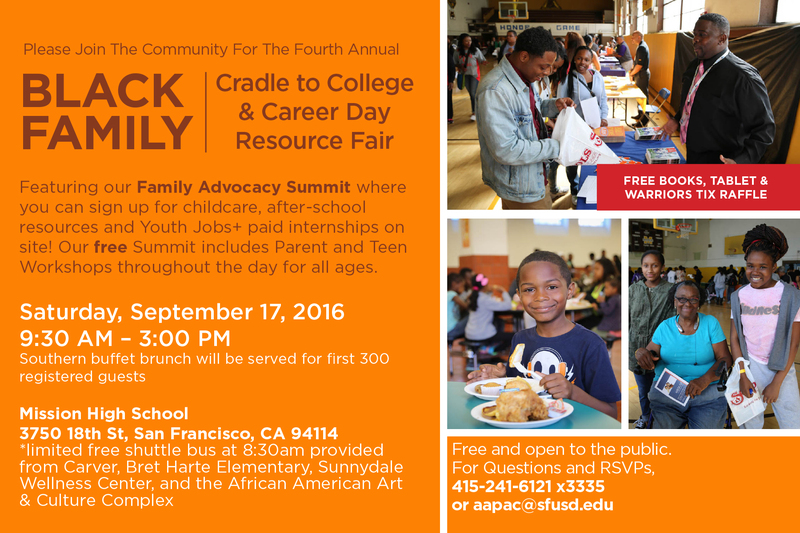 Our college fair event is free and open to all students of the San Francisco Unified School District. Students who wish to apply and qualify for “on-the-spot” admissions and scholarships should bring an official transcript, if available, and a copy of their ACT/SAT test scores, if taken, for each college application they plan to complete. In addition, uAspire – an organization dedicated to helping families afford college – will share information on developing affordable financial aid packages. All high school students and their parents will benefit from this annual college planning event and opportunity. This event takes place on Monday, September 12, 2016 at Mission High School from 4:00 – 8:00 pm. 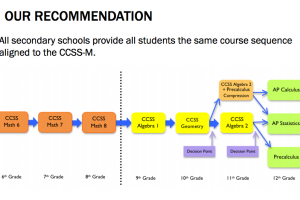 If you have any questions or requests for information, please contact the African American Postsecondary Pathway Program Manager, Linda Jordan (JordanL AT sfusd.edu) or call 415-241-6240 X 3315 (Office). 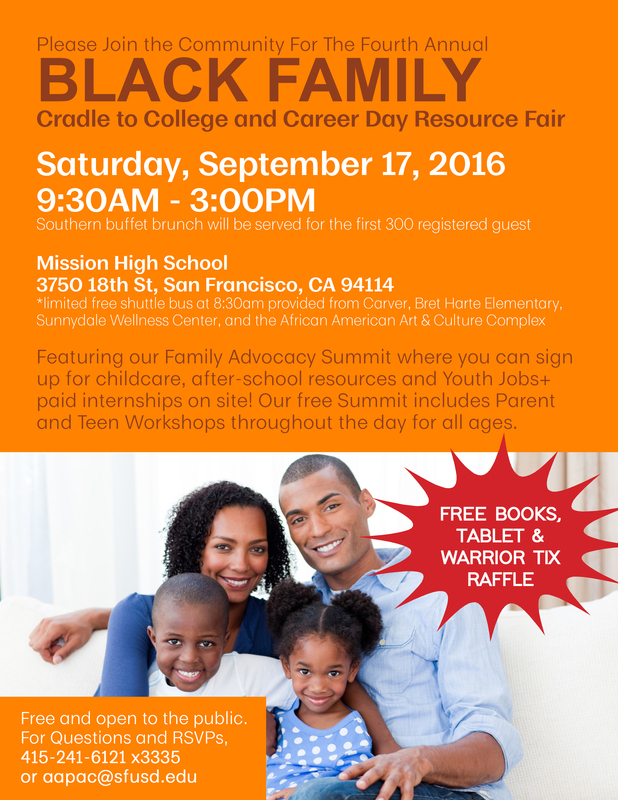 I’m really excited about this next event which takes place the following Saturday, September 17, 2016 at Mission High School from 9:30 – 3:00pm. The district will partner with agencies across the city to host another annual Black Family Day to support Black families across the district. I’ll be there with my girls in tow in support of the district’s efforts to help ALL schools in the district reach out to create welcoming and inclusive schools for ALL Black families. Black Families Rock: Families can register here (thought it’s NOT required! ): https://www.eventbrite.com/e/black-family-cradle-to-college-and-career-day-resource-fair-tickets-27362052636 and the flyer is attached here. Don’t miss this fun, family event. There are great give-aways including free tablets, books and even Warrior tickets! Here’s the line up of fall 2016 events coming up. Please tell your friends and I hope I’ll see you there!!! Very exciting. Thanks for your help in supporting and making such events be successful.